You guys are really good at solving the What Am I? puzzle..so I've got to start playing dirty. Guess the make/model of this concept car. UPDATE: It took some time, but Kaibeezy and [correction] Dr. D cracked this one wide open! I did two things, first a color shift to blue (just because I am a jerk) and then I cropped it so that the passenger headlamp looked like it could have come from the driver's side. 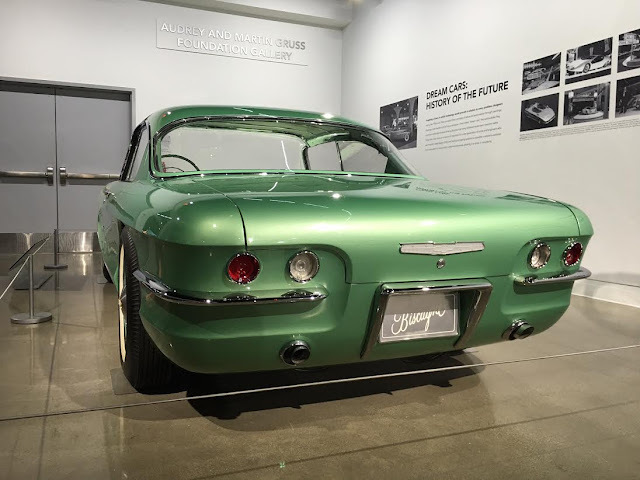 Pics of the 1955 Chevrolet Biscayne from the Petersen Auto Museum I snapped last week. by gum, the chap's buggy whipped it! - huzzah, and so forth! Bezel is totally different, glass is not the same...it does look similar, but it is not. I feel like I'm close with this Chrysler Ghia, but it isn't quite exactly right. Hmm, not a Stutz Blackhawk or Studebaker Lark with the faux-Mercedes grill... that much chrome on a headlight makes it look like some kind of faux-tique or replica thing. I was going to say feels 30s BMW-ish or 50s Studebakerish, but I got nuffin at the moment. At first I was thinking it was the 1946 Holden No.1 prototype, but upon close inspection of the headlight bezel I had to rule that out. Okay I hope this works to embed the image (should have spelled out "image" instead of "img") -- if not I need remedial instruction. A doctor you might be...but you need help from an optometrist. Yes Kaibeezy. This is it. Did my photoshop color shift throw you a little bit??? nope ;) - now the real question is, does anyone *else* know what it is? Well my next guess was going to be the 1955 Chevrolet Biscayne concept car, but I don't think that's quite right either. Ding ding ding! 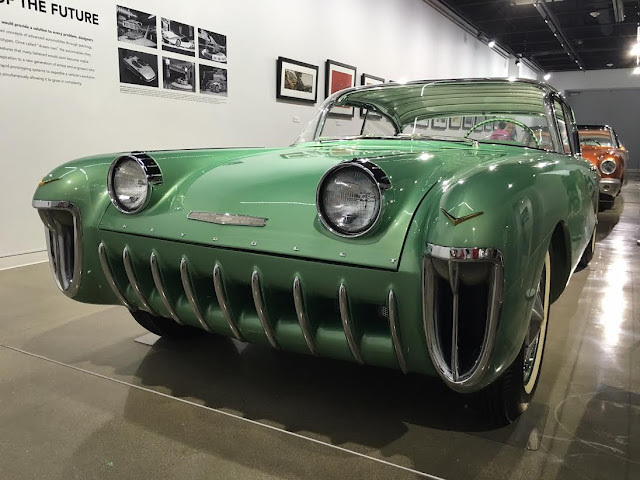 Yes, this is a 1955 Chevrolet Biscayne concept car! Straight from a pic at the Petersen Automotive Museum I snapped last week. 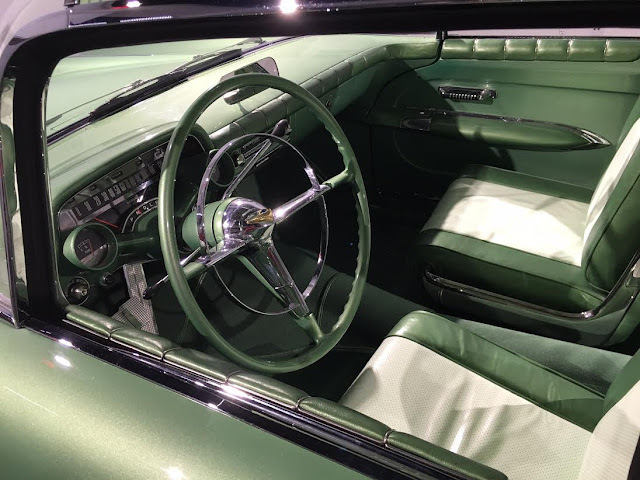 55 Biscayne? - no way! So while searching for this answer, I found this listing on eBay....this is sofa king awesome. oops, forgot the width tag...sorry guys. Still awesome. Holy cow you are getting sneaky! Next you'll be having us try to identify some snippet of a car you drew with crayon when you were 5. Also as an aside, it's just "Dr. D" not "Dr. Del" -- I only say that because I think there is a "Dr. Del" who comments on car blogs who is not me. My handle actually comes from Dr. Dolittle. I'm not really a doctor. I am a litigator, and at an old firm someone started calling me "Dr. Dolittle" because I was the guy who could "talk to the animals." Nobody really calls me that anymore, but I was looking for a short and easy to remember nickname, and that's how I chose "Dr. D"
Dr. D -- sorry, I was getting you confused with DoctorDel who does indeed comment on this site. And yes, the next What Am I? is going to be a picture of a blank page from a car manual and you have to guess the car. Actually...that isn't a bad idea. Well if it's a blank page from a car manual I'm going to guess it's the page referenced in the Fiat 124 Owner's manual under the index heading "Electrical Problems." 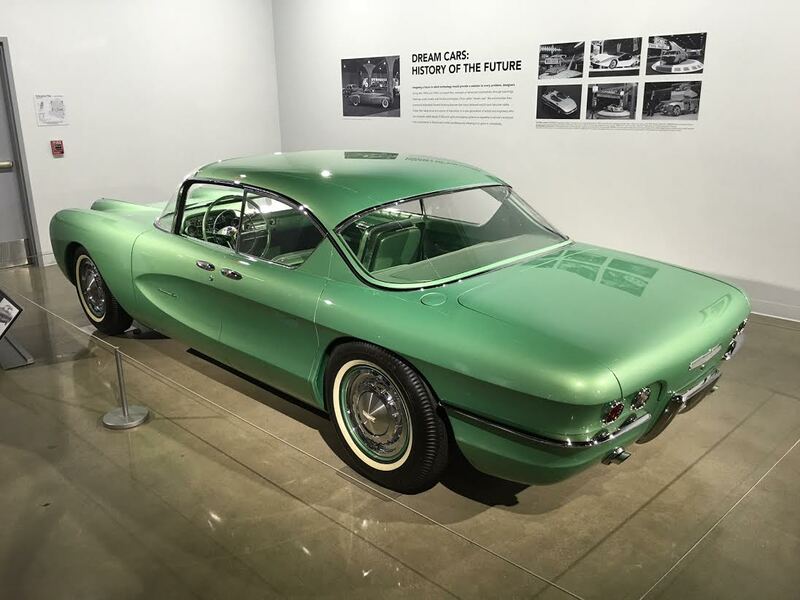 Some later Corvette styling here with the cove in reverse, the rear end license, bumpers, and exhaust of the '61 and later. The headlight surround and front fender scoops for the '56 and "57. The trim around the roof is cool with the first rear pillar " kink " I have ever seen. Yikes. That Volvo Kaibeezy found looks like the Volvo guys were barhopping with some girls from Renault... complete with a very un-Volvolike Blond Vixen in the ad. At least they called their cold, chilly design the Tundra (no doubt because Saab had already taken the name "Vixen"). Or am I wrong? You guys are the Volvo Jedimästaren... did Volvo (like most other car companies) go through a "we'll post hot ladies in back of our ugly weird car" phase?